So I’ve been reading a lot of other people’s blogs and it seems that at the beginning of the month people do crazy things like join challenges and set goals. I can’t be certain, but I think they intend to actually follow them too. There are crazy people out there! There are crazy people right here too, so I decided to join them. I actually joined 2 things on line today, both which seem like fun. 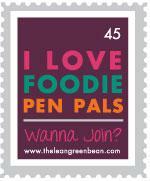 The first is 100% fun, I joined Lindsay’s Foodie Pen Pals at The Lean Green Bean. Basically you sign up on her site and she pairs you with 2 other ‘pen pals’. The first one sends you a box of food and you send a box of food to the second one. There isn’t any limits on what you can send except for it shouldn’t go over $15 and of course it ought to be shippable. So I am now on a hunt to find great food made locally, seems like my items should be very Floridian! The second is maybe not as fun. At MizFitOnline she issued a challenge to quit all processed foods for 30 days. Actually, she said she got it from Greatist, but there are so many posts there I can’t find anything about it. I did find this though. I won’t be trying it for 30 days as alcohol does slightly strike me as processed, but I’m sure I’ll find a reason why that’s not true before the 30 days are up. My other goal for this month is to actually HAVE a goal for running by the end of the month. I know I want to be a stronger runner, but I don’t know what that means, even just to me. Do I want to run further? Do I want to run faster? Do I want to run more often? Can I call it a running streak if I only run 1/2 a mile a day? Yes, yes, yes, not officially. So for the moment my only running goal is to decide on a goal and to run at least 3 times a week. That’s always my goal, rarely what I actually do.